Sterling Silver is a fantastic precious metal for Wedding Ring Bands, many prefer Silver over Gold for its natural appearance. Wedding Ring Bands in Sterling Silver are reasonably priced and can be exceptionally beautiful pieces of Jewelry that last a lifetime. Durango Silver Company of Durango produces high quality Wedding Ring Bands that stand out from most others, our distinct Wedding Ring designs are very attractive and affordable. Above and to the left is a Native American Handmade Silver and Turquoise Wedding Ring Band with distinct character and beauty. We carry a variety of Native American handmade Wedding Ring Bands that are inlaid with many types of gemstones including Turquoise, Coral, Lapis and also have multi-colored gemstones Bands that are very attractive. 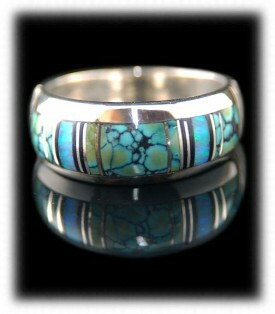 A Turquoise Wedding Ring Band is a great choice and many love this style of Ring as they are very colorful. To the right of the Turquoise Wedding Ring is one of the finely crafted Sterling Silver Wedding Ring Bands from the Durango Silver Wedding Ring Bands collection. This Wedding Ring is made in Sterling Silver, Gold Wedding Rings are made to order, it is a substantial weight Ring that will last a lifetime and is a very attractive Ring for both men and women. 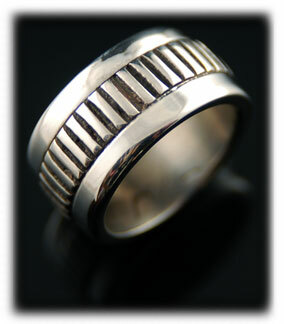 This Wedding Ring Band measures 10mm wide which is wider than the average production Wedding Band. The deep stamp work in the center of this band go all the way around so if the band turns on your finger the design remains the same. 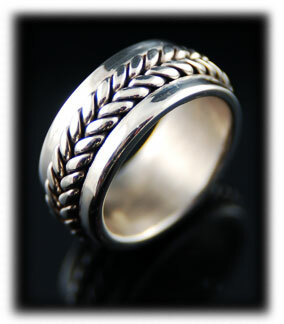 This is a great example of the fine our American made Wedding Ring Silver Bands. Above and to the left is a beautiful Silver Wedding Ring Band created by John Hartman of Durango Silver Company. 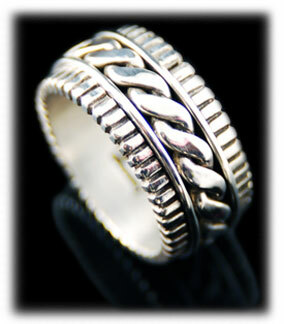 This particular Ring Band has a heavy Silver braid in the center and then finished off with wide bands of Silver. This Silver Ring Band is 10mm wide, which, is a fairly wide Ring Band - it does make a statement on ones finger when worn. This as well as all of the other Wedding Ring Bands produced by Durango Silver Company are substantial pieces of Silver Jewelry, you will not find comparable Silver Wedding Ring Bands on in the marketplace easily. We have been making custom Wedding Ring Bands for over 40 years and our customers seek us out for our quality Sterling Silver Southwestern styled Wedding Bands. 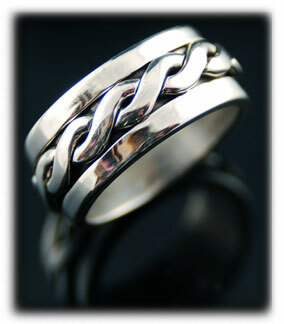 To the right is another Wedding Ring Band with a braid design in the center, it is outlined with round bands of Silver and then finished with solid bands of Silver. 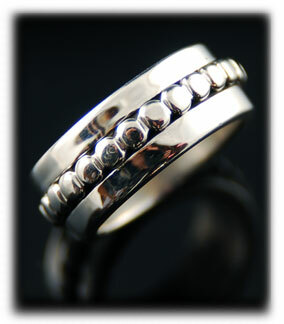 This Wedding Band is 10mm wide and is very attractive when worn by both men and women. We also make this Ring Band in Gold upon special order and it makes an outstanding Gold Wedding Ring Band. Sterling Silver Wedding Ring Bands are our specialty, however, we can make most of our Wedding Band designs in Gold as well. Above and to the left is one of our Silver Wedding Ring Bands with braided Silver in the center of the band. This Wedding Band has two braided Silver bands that were twisted in opposite directions which make an unusual pattern, the band is finished off with bands of Silver on each side of the double braid. 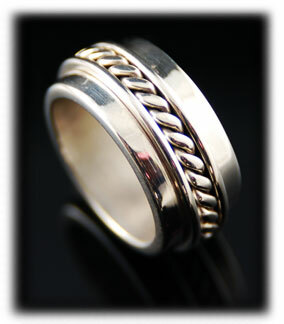 This Wedding Ring Band is 10mm wide and is very attractive for both men and women. The Wedding Ring Band on the right features a heavy bead design with bands of Silver to each side. We make several styles of Wedding Ring Bands with beaded designs that you can view on the Durango Silver Company Website. We invite you to visit our website where you will find a unique variety of Sterling Silver Jewelry from the American Southwest. Our Jewelry is unique with distinctive design that is different from what you will find in your typical Jewelry store. We have been producing high quality Jewelry for over 40 years in the Southwestern United States and we guarantee our Jewelry to be world class.